One of the very few analogue machines I own and have messed with. 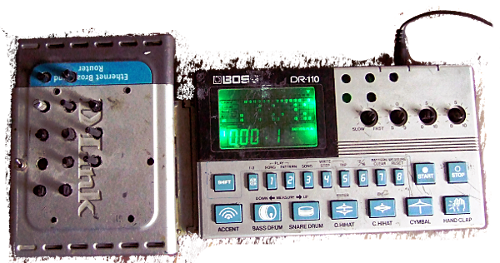 The Boss DR-110 was the last analogue Drumbox built by Roland. Fun fact: Boss, Roland and Edirol are actually the same company. In its vanilla state this one must be quite a disappointment for those used to the power of the better known Roland machines. It has its charm, but certainly lacks the punch and versatility of an 909 or 808. Then again, it's a lot smaller, comes for waaaaay cheaper and has a few nifty tricks up its own sleeve. Gorgeous claps, for a start. I don't remember what I paid for mine, but it must have been in the 10-30 Euro range most of my instruments were in. It is very easy to program and the preset beats, despite all their cheesiness, can be unexpectedly funky if played at the right speed. It can run on batteries, which also retain its memory, but I've stopped bothering with them years ago and now, I mostly use presets or program beats on the fly. In the rather unlikely event of coming up with a rythm that I really need to keep, I just take a photo of the display, the grid structure is perfect for this. With analogue gear, you usually don't achieve very much with the common 'poke-around-on-the-circuit-board-and-see-what-happens'- approach. You can get nice effects, but most of the time, you end up with mostly annoying, rarely controllable noises or fried parts. So this had to be done with a bit more of a plan. Luckily, the DR110 has a pcb that's not too complex, the schematics float freely around the internet and there's plenty of websites telling you which resistors to replace with which pots are. How did you do the backlight? Very cool!